I've railed before on how I hate Wall Street being used as a barometer of the health of the country's economy, much less that of the food and beverage industry. I hate it even more when someone with no other credentials than a boatload of money thinks he can tell a company how to operate. Last month brought me more ammunition. Nelson Peltz, founding partner and chief executive of Trian Fund Management, apparently is rich enough to buy his way into companies but not really talented enough to operate one – a real one, I mean, one that makes things besides money. Sure, he has suggestions for how they can better operate, but always by tearing apart, never by building up. And always with the primary goal of making Nelson Peltz a richer man. Peltz reportedly has more than a billion dollars worth of stock in both PepsiCo and Mondelez. So it's kind of like what we here in Chicago have been hearing for decades, maybe centuries: When a politician tells a city department head to buy supplies from a certain company, you know who's really profiting. I gotta say I was not fond of the evolution of Mondelez. It came about in steps as Irene Rosenfeld, then chairman/CEO of Kraft, made several acquisitions then overreached when she bought Cadbury in 2010. That really set the stage for the split of Kraft into two companies, one (the new Kraft Foods Group) focused on American grocery staples and the other (Mondelez) on international snacks and sweets. Neither company is growing as fast as expected, but Ms. Rosenfeld's salary sure is. As we pointed out in our report last month on CEO salaries, her total direct compensation last year was $21.6 million. Who should be our 2013 Processor of the Year? Speaking of gauges of success, it's time for me to look all the way to the end of the year, to the cover story of our December issue. 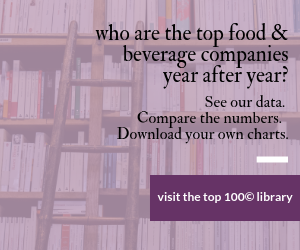 That's when we reveal our Processor of the Year, a food or beverage company that's had a great year or two. The criteria are sound financial performance (including expanding sales and profitability), innovative product development, leading manufacturing technology, managerial excellence, general industry leadership and service. So nominate a company by visitin our nomination page or by sending me an email, and write a line or two about why you think they're worthy of this honor. Which brings me back to Smithfield Foods and C. Larry Pope. As CEO of the big pork company, Pope's 2012 take was nearly $12.9 million, about 7 percent of Smithfield's total profit last year. The debate rages on whether Smithfield should be allowed to sell itself to China's biggest meat processor, Shuanghui International Holdings. Imagine what Larry's golden parachute will be from that deal. Legal or not, the sale is a knife in the heart of American industry. I strongly doubt Shuanghui will increase U.S. employment once the deal goes through. So it's with a heavy heart that I direct you to our cover story this month – which, ironically, is all about numbers, sales and profits, who's bigger than whom. Our Top 100© is certainly a clear gauge of success; although in the mood I'm in now, I wish we could come up with a happiness- or great employer-based Top 100. What's most remarkable is the new companies on the list who resulted from corporate split-ups. Mondelez is on there; so are Hillshire Brands, WhiteWave Foods and Post Foods. All former victims of acquisitions, now back on their own. Wish them luck. But the other remarkable fact in this year's Top 100© table is the improved business climate for all these companies. Only two of the top 26 companies saw sales decline in 2012, and those – Dean Foods and Kraft – are the result of splits. On the whole list, only four companies lost money in 2012, down from six last year. This is also a good time for me to direct you to the online-only components of our Top 100. We have a truly remarkable tool at www.FoodProcessing.com/top100. The vertical columns are sortable. Click Company Name to make the list alphabetic. Sort it by Total Company Sales. Or create a list based on profitability. However you sort it, click on a company name and you get each company's profile – headquarters addresses, top executives, subsidiaries, even brands. You may want to refer to it all year. Peltz's Trian Fund suggests creating world's biggest snack company.